Sennheiser as a brand needs no introduction. It has some finest range of headphones with exceptional sound quality. Overall Sennheiser PXC 550 headphone is said to be satisfactory in sound performance but not over the top. But the amazing feature of this headphone makes it a very versatile choice. The performance of the headphone is above average in most features. The reason to write this Sennheiser PXC 550 review is to give you an idea about its features in detail. The design and look of the headphone are indeed great and this makes it the most popular headphone for the price it offers. Sennheiser PXC 550 headphone offers customized sound and that is suitable for your critical listening. The isolation of the headphone is not that great and it suffers from this feature. The best part about the headphone is it’s completely light in weight. You can easily enjoy your long music sessions without any pressure. Being a wireless headphone, it does not really suffer in connectivity. The connectivity of the headphone is good and the Bluetooth works just fine. Sennheiser PXC 550 features an adaptive noise-canceling feature that blocks the ambient sound. The headphone comes with a touch control option that saves a lot of time. The battery performance of the headphone is also quite decent. It lasts up to 30 hours if you don’t use the active noise canceling mode. It’s ideal for your music playlist and you can buy it for its sound performance. But, the headphone won’t really offer you a great audio quality. Its designed for your traveling needs. You can use the headphone when you travel as it also has active noise cancelation. Noise guard technology in noise cancellation gives you a great audio quality by canceling the noise of the environment. So, it can help you if you want to hear your music in complete isolation. The feature is also good for outdoors. Is it ideal for your gym sessions? Yes, the headphone works well for your long gym sessions or any outdoor activity. As the fit is comfortable, you will not feel any clamping or pressure around your ears. You can also use the headphone while working out. It is also good for gaming. Though, there can be a leakage in the sound of the headphone. You can still use the headphone for its decent sound performance. The headphone is also good if you enjoy only music. The sound may not be perfect but still, it offers decent sound performance and you can surely consider it for this price. Sennheiser PXC 550 features NoiseGard Adaptive Noise Cancelling. It quiets the surroundings to ensure continuous listening by modifying to environment noise. Whether you are in a car or a plane, it delivers the level of noise restraint to provide you a comfortable listening experience. The headphone gives you outstanding battery Performance. The headphone has a backup of 30-hours in a single charge. If you switch on the active noise-canceling mode, then it can work up to 30 hours. If you use the headphone with an active mode, then it can drain quickly. It lets you charge the battery with the help of a remote cable. The charging time is quick too. Sennheiser PXC 550 headphone offers advanced sound quality. The headphone delivers true signature sound quality. Music is presented with outstanding transparency and fine balance. There are selectable sound modes in the headphone that allow you to modify the sound as per your need. This saves a lot of time and lets you enjoy your music on the go. The headphone is not only light in weight but also comfortable. The ergonomically engineered padded headband on the headphone provides a great fit. And, revolving ear cups provide far-fetched comfort for your long music playlists. The collapsible frame is too stylish so you can also flaunt it. It has total wireless control. The wireless technology of the headphone allows full freedom of movement with great sound quality. It features Bluetooth 4.2 to connect with any mobile or Bluetooth enabled device. You can hear music or simply make calls with its wireless connectivity. The headphone has a touch interface. The headphone has touch control with amazing voice prompts that make it easy to use the headphone. An amazing touchpad on the right ear cup of the headphone has volume, stop and play controls. By simply touching the earcups, you would be able to make calls or listen to your playlist. Sennheiser PXC 550 headphone lets you stay connected on the move with it’s class communication feature. The headphone can also integrate with Captune App. This helps to provide great sound performance and stream your music directly on your device. The app is available in Android and IOS both. The headphone has Impedance: Active 490 Ohm/ Passive 46 Ohm. Sennheiser PXC 550 is great in fit. Its the best closed back earphone if you compare it with other headphones that are available in this range. It’s not only well padded but the ear cups are large to give you a great fit. The headband though cushioned is light in weight. However, if you wear the headphone for too long, then it can cause some clamping or you might feel some pressure on your ears. The headphone also has a problem with adjustment. If your head size is small, then it can cause some problems. Still, for the price, the headphone is indeed good in comfort. 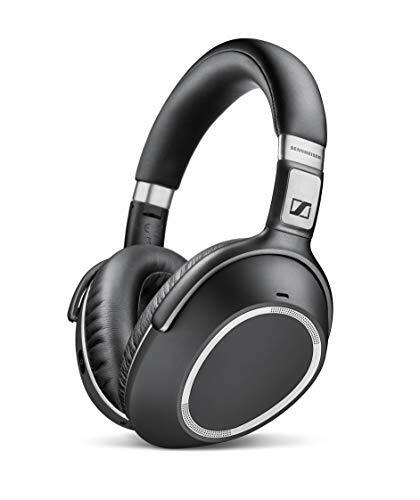 Sennheiser PXC 550 headphone features active noise canceling feature with noise guard adaptive technology. You can expect isolation of sound with this feature. But, this feature does not completely block the ambient sound. As compared to other features, the performance of noise cancellation is below par. You won’t get complete soundproof audio with this feature even if you are traveling. If you are buying this headphone for noise canceling feature, then indeed you will be disappointed somewhere. The feature just works fine and is not that great. There are better headphones available with active noise cancellation feature. Sennheiser PXC 550 headphone is truly sleek and stylish in design. It has a premium finish and takes care of complete comfort too. The headband of the headphone is well padded so you will not feel any tightness while wearing the headphone for long hours. The build quality of this headphone is durable. Even if you drop the headphone several times, there won’t be any issue with the sound of the headphone. Sennheiser PXC 550 headphone is not so portable but it it’s great for your outdoor activities. You can easily carry the headphone in folded case. Sennheiser PXC 550 headphone is a good sounding headphone. The audio is well balanced and the bass base of the headphone is great. The midrange frequency of the headphone is good also is the treble. The low-frequency range of the headphone is average. The soundstage feature of the headphone is not that great and it suffers in this department. If you compare the headphone with other headphones in this range, then speaker like the sound is also missing. Overall, it’s good for your long music sessions. But, the audio performance of the headphone is not outstanding. The battery performance of the Sennheiser PXC 550 headphone is amazing. It has up to 30 hours of playback time with the wireless feature. However, if you switch on the noise-canceling mode in the headphone, then the battery can drain faster. You can hear music for hours without any disturbance with the amazing battery life. The charge is quick and the battery is replaceable too. The battery performance of the headphone is indeed better if you compare it with other headphones in this range. The sound can be customized. The audio is good in mid-range. The isolation is not that great. The sound can leak at times. The fit is just ok. There can be a distortion in the sound. Sennheiser PXC 550 has amazing features with good sound performance. The best part about the headphone is that you can customize it according to your need. The control features of the headphone are also good. Though the headphone has an active noise cancellation feature, it’s not that amazing. You won’t get complete isolation in sound with this feature. Look wise too; this headphone is not so amazing. There are better wireless headphones available in this price range. The headphone is light in weight. Even if you wear the headphone for hours, you will not feel any kind of pressure on your ears. The headphone can suffer in higher volume or high-frequency base and the sound can also leak. If you are looking to buy a headphone for your regular use, then this one is indeed good for the budget. But, don’t expect exceptional sound quality and great performance. The headphone is popular and well-liked for the features it offers. Hope you enjoyed this Sennheiser PXC 550 review. Do leave your comments and feedback in the comment box below!